September 17th is Ganesh's birthday! Ganesh is the Hindu God of success and new beginnings-he removes obstacles that stand in the way of you obtaining your dreams. He brings success and wealth through wisdom, education and knowledge. Ganesh has the head of an elephant as elephants were the "bulldozers" of ancient times. Cultures that were fortunate enough to have elephants used them to build roads, clear land and erect cities with the animal's mighty power. Elephant trunks can rip trees from their roots, yet tip of their trunk is so sensitive that it can pick a flower. Ganesh is the great remover of obstacles as well as the master of delicate issues. Offer him plantains, coins, honey, milk, incense, orange or yellow candles and fresh water. 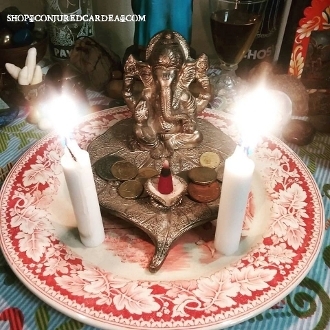 This service is to honor Ganesh on his birthday. Please leave any specific dedications of gratitude in the "special instructions" area.